Imagine you’re faced with a natural disaster that forces you from your home or office with only the clothes on your back and the socks on your feet. Fast forward a month. Imagine you’ve been staying in an emergency shelter, and you’re still wearing the same socks. There’s barely enough water to drink, so laundry is out of the question. This discomfort is a minor part of the harsh reality for thousands of people facing an uncertain future in shelters throughout northeastern Japan as a result of the devastating earthquake and tsunami on March 11. While Japan faces an uphill battle as cleanup continues and nuclear disaster looms, the tragic events have triggered a worldwide outpouring of support, with the majority of the relief taking the form of monetary donations. However, small groups have formed to provide comfort and cheer in more humble ways. 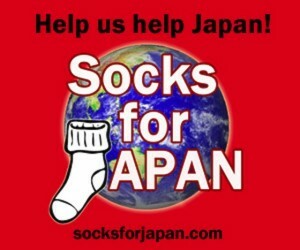 One such group is Socks for Japan, begun by Jason Kelly, an American writer who lives in Sano, Tochigi Prefecture. Through his organization, Kelly collects brand new pairs of socks for men, women, and children from people all over the world. After hearing a number of news reports in which shelter occupants expressed a desire for clean, warm socks, Kelly started Socks for Japan so he could help his adopted homeland during this difficult time. Through Socks for Japan, Kelly and his team of around 30 volunteers have delivered tens of thousands of pairs of donated socks to shelters in the hardest hit areas of northeastern Japan. These donors are asked to remove all tags from the socks and place each pair in individual plastic re-sealable bags with a personal note written in Japanese tucked inside. Critics of this program tend to think of socks as frivolous. Why send socks when money and food are more urgently needed? Kelly agrees, but he leaves the big stuff to the big guys. To do that Kelly focuses on the personal touch, the face-to-face interaction he and his fellow volunteers provide. “Once the homes and food are provided by the much larger, better equipped operations, then we can come in and provide a little cheer during the day,” says Kelly. Sending socks is also a way for people who are uncomfortable sending money to contribute. “They don’t know if [money] really gets to the affected area,” Kelly says of those who are hesitant to donate money. With their focus on just socks, Socks for Japan can turn around the distribution process quickly. Other criticisms aimed at Socks for Japan are that they are wasting fuel and clogging the roadways when they make deliveries. Kelly and his team meticulously research where they are going and the best routes to take so that it requires minimal refueling. People who work in gas stations offer their help in finding convenient places to refuel where Socks for Japan won’t compromise local residents. Several people contributed the use of their vans, and their routes have been clear when they’ve made their early morning runs to shelters. In addition to the tricky issue of gas, the group has also braved dangerous regions where radiation is an issue. “We have to keep worrying about how much exposure we’re willing to experience ourselves to get these socks and letters out to people,” says Kelly. Thus far the group has been fortunate that the radiation in areas around shelters has been “reasonable” enough to make their deliveries. Radiation risks aside, delivering socks may seem like a small gesture, but Kelly maintains that Socks for Japan is making a difference. With each visit, they have put smiles on the faces of thousands of people who have had little to smile about in the last month. In the four weeks since the disaster, Kelly and his crew have received socks from about fifteen countries, including huge shipments from Malaysia and a few pairs from Bulgaria. Even Japanese in unaffected areas of Japan are sending socks, thanks to the postal service, which is spreading the word of Socks for Japan. Kelly has also received more than a thousand pairs of socks and unexpected translation services from a New York area woman. Makiko Oku, a doctoral student at Rutgers who is writing her dissertation, is a native Japanese who experienced the Kobe earthquake in 1995 while attending college in nearby Kyoto. Heartbroken after watching the footage of the recent earthquake and tsunami on TV and feeling the need to help in any way she could, Oku searched for a way to make a difference. When a local friend found the Socks for Japan website, they both knew they found the right cause. Oku began collecting socks in her Jersey City apartment, and her first shipment to Kelly contained 300 pairs of socks. Her second, 808. Some donations came from friends, and Oku also recruited eight schools in New York and three schools in New Jersey, ranging from elementary to college, to participate. She prints out letters in English and Japanese, wraps them around each pair of socks, and seals them with labels bearing the photos of the donors. The processing is time consuming as well as a drain on printer ink cartridges, but Oku is happy to do it. She was one of the first donors to Socks for Japan, and Kelly noticed her beautifully packaged socks, as well as her perfect Japanese. The team had three people translating messages on their website, and after Kelly and Oku began communicating, “She just jumped in and really became a part of this,” says Kelly of the translation work Oku does for Socks for Japan. Another local resident who organized sock collections among friends and colleagues in NYC is Lisa Birzen, who taught in Japan through the Japan Exchange and Teaching (JET) Program. Like many people around the world, Birzen struggled with how she could help. Kelly has seen firsthand that the gift of socks is making a deep impression. “Believe me, when we show up at a shelter with bundles of clean socks and care letters, it sends a bolt of cheer through the place,” he says. After the first few deliveries, Kelly started receiving requests for deliveries from area shelters. And the socks keep coming. As recently as last week, Oku sent another 700 pairs of socks to Kelly’s office, and she’s currently processing more than 3 thousand donations. People are reaching out to Japan with socks. 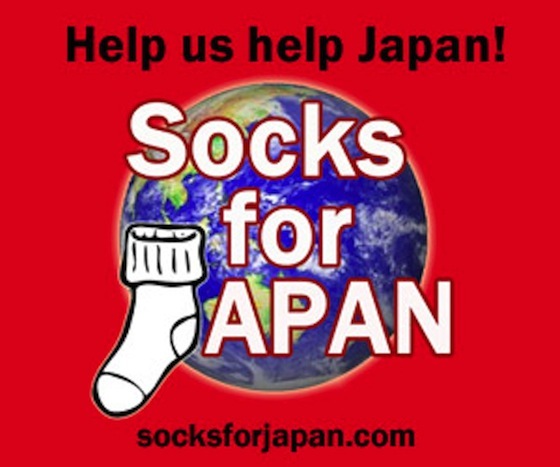 “In addition to providing a way to contribute directly, perhaps more significantly, Socks for Japan also provides a way to connect people from all around the world, illustrating the notion of global solidarity,” explains Birzen. Kelly knows Socks for Japan won’t last forever. The volunteers are paying close attention to the shelters, and as people move out of emergency housing and into public housing and relatives’ homes, Socks for Japan will ramp down operations. “No sock will be wasted,” promises Kelly, who has already made arrangements with city relief efforts to take Socks for Japan’s surplus. In the meantime, the volunteers at Socks for Japan will gladly accept your donations. They find that the greatest need is socks for men and women. Kelly also points out that quality is important as well. “If somebody is choosing between sending 100 pairs of ‘okay’ socks or 20 pairs of really nice socks with carefully prepared letters, do the 20 nice socks,” advises Kelly. A pair of socks may seem trivial or silly, but you’d be surprised at how immediately it can touch someone’s heart. Perhaps that heart may be your own.